Just for fun, I've created a site called Heady Stuff, which can be found here: HeadyStuff. On this site, you can purchase custom-designed T-Shirts, Sweatshirts, Mugs and more. Since I'm in charge of the store, I can have the fun of designing many of the shirts and mugs myself. So, naturally, I've designed a lot of products around my own interests, such as classical music, opera, ham radio, math and science and a whole lot more. But, don't worry, there's also a lot of silly stuff. Check it out! You'll see. At the moment, I've divided the store into a few categories, such as: Arts and Music, Math and Science, Ham Radio, Silly Stuff, and Word Clouds. I'll place below a few low resolution thumbnails of some of the more colorful designs that are available. But, there's lots more than just what is shown here. For now, click any picture below to see shirts and mugs with that particular design...or click one of the more general categories mentioned just above. Enjoy! 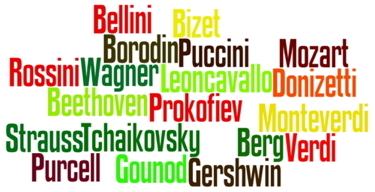 Here's a design featuring Famous Operatic Composers: Verdi, Puccini, Bizet, Mozart, Gounod, Wagner, Bellini, Leoncavallo, Strauss, Rossini, Purcell, Donizetti, Tchaikovsky, Beethoven, Borodin, Monteverdi, Gershwin, Prokofiev, and Berg. 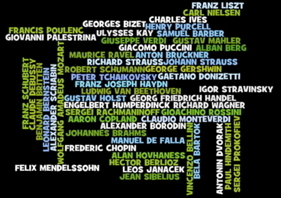 Here's a design featuring a really long list of Classical Music Composers: Samuel Barber, Bela Bartok, Ludwig Van Beethoven, Vincenzo Bellini, Alban Berg, Hector Berlioz, Leonard Bernstein, Georges Bizet, Alexander Borodin, Johannes Brahms, Benjamin Britten, Anton Bruckner, Frederic Chopin, Aaron Copland, Claude Debussy, Gaetano Donizetti, Antonin Dvorak, Manuel De Falla , George Gershwin , Georg Friedrich Handel, Franz Joseph Haydn, Paul Hindemith, Gustav Holst, Alan Hovhaness, Engelbert Humperdinck, Charles Ives, Leos Janacek, Ulysses Kay, Franz Liszt, Gustav Mahler, Felix Mendelssohn, Claudio Monteverdi, Wolfgang Amadeus Mozart, Carl Nielsen, Giovanni Palestrina, Francis Poulenc, Sergei Prokofiev, Giacomo Puccini, Henry Purcell, Sergei Rachmaninoff, Maurice Ravel, Gioachino Rossini, Franz Schubert, Robert Schumann, Alexander Scriabin, Jean Sibelius, Johann Strauss, Richard Strauss, Igor Stravinsky, Peter Tchaikovsky, Giuseppe Verdi, and Richard Wagner. WOW! 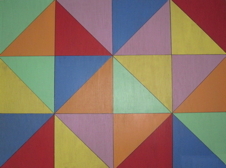 These are some of my own creations (can you tell!). One is very un-structured and one is very structured. The originals were both painted using house paint on multi-foot sized pieces of plywood, but now they're available as shirts and mugs. 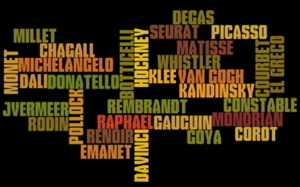 Here's another word cloud design featuring famous artists: Renoir, Rodin, Botticelli, Corot, Monet, Davinci, Hockney, Donatello, Degas, Emanet, El Greco, Goya, Seurat, Courbet, Matisse, Pollock, Vermeer, Constable, Kandinsky, Chagall, Michelangelo, Millet, Picasso, Gauguin, Klee, Mondrian, Raphael, Rembrandt, Dali, Van Gogh, and Whistler. 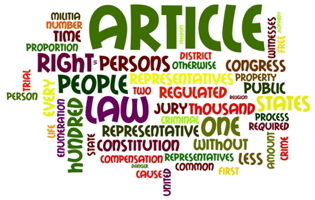 In these next two examples, I made colorful word clouds from the text of famous documents. Can you guess which documents they are? (SPOILER ALERT: Stop reading if you don't want to know....it's the Bill of Rights and the Declaration of Independence.) 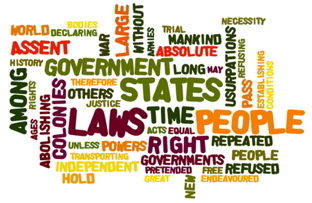 More word clouds of other famous documents and/speeches are on the Heady Stuff site. 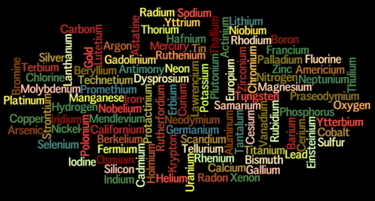 In these next two examples, I made colorful word clouds from the list of Chemical Elements and the Constellations. 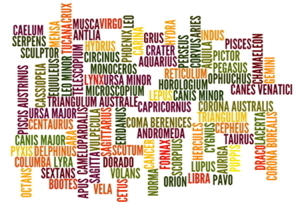 Lots more math, science and astronomy designs on the Heady Stuff site. As a ham radio operator myself, this next design is one of my favorites. 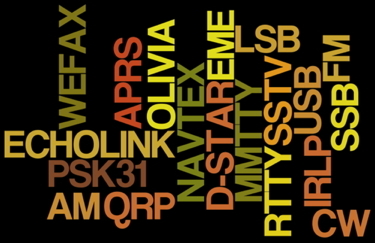 It shows many (not all) of the various modes of operations that hams can enjoy....such as AM and FM, Single Side Band (SSB), Upper Side Band (USB), Lower Side Band (LSB), Slow Scan TV (SSTV), Earth-Moon-Earth (EME), Low Power Operation (QRP), Continuous Wave (also known as Morse Code, or CW), and lots more. If you need a gift for a ham, I think you just found it! 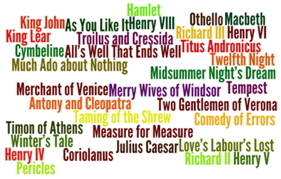 And for you Shakespeare fans (you know who you are! ), there's a little something for you too...all his plays! If you don't believe me, count 'em for yourself: All's Well That Ends Well, Antony and Cleopatra, As You Like It, Comedy of Errors, Coriolanus, Cymbeline, Hamlet, Henry IV, Henry V, Henry VI, Henry VIII, Julius Caesar, King John, King Lear, Love's Labour's Lost, Macbeth, Measure for Measure, Merchant of Venice, Merry Wives of Windsor, Midsummer Night's Dream, Much Ado about Nothing, Othello, Pericles, Richard II, Richard III, Taming of the Shrew, Tempest, Timon of Athens, Titus Andronicus, Troilus and Cressida, Twelfth Night, Two Gentlemen of Verona, and Winter's Tale.